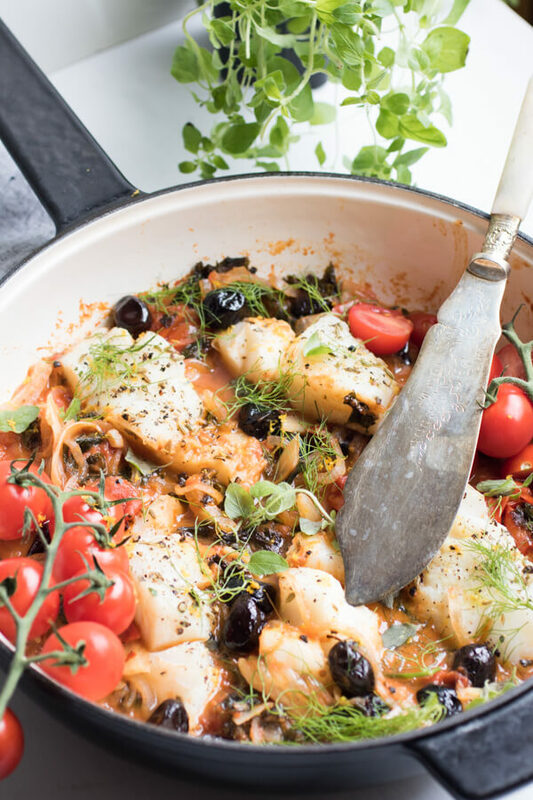 Easy Mediterranean cod with fennel, kale and black olives, a healthy complete meal prepared in one pan and ready in 30 minutes! 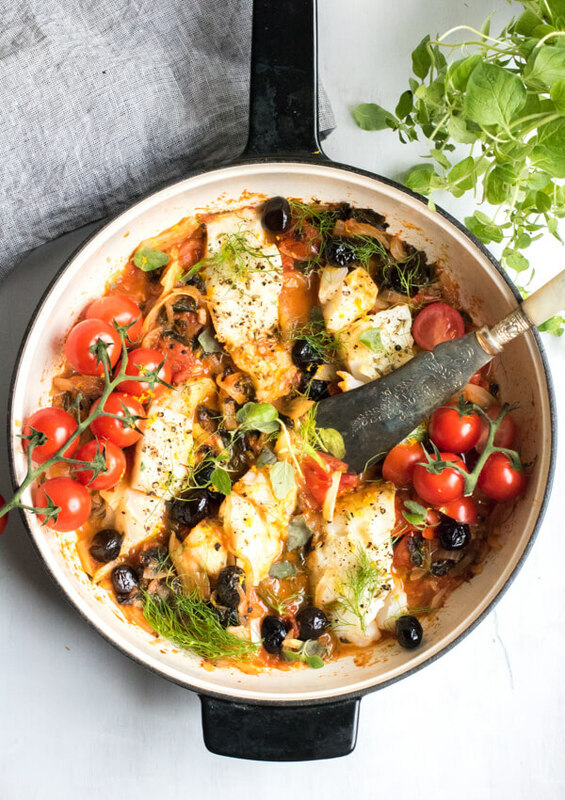 Perfectly flaky cod nestled in a tomato fennel broth with briny olives, bright orange zest, and floral oregano. 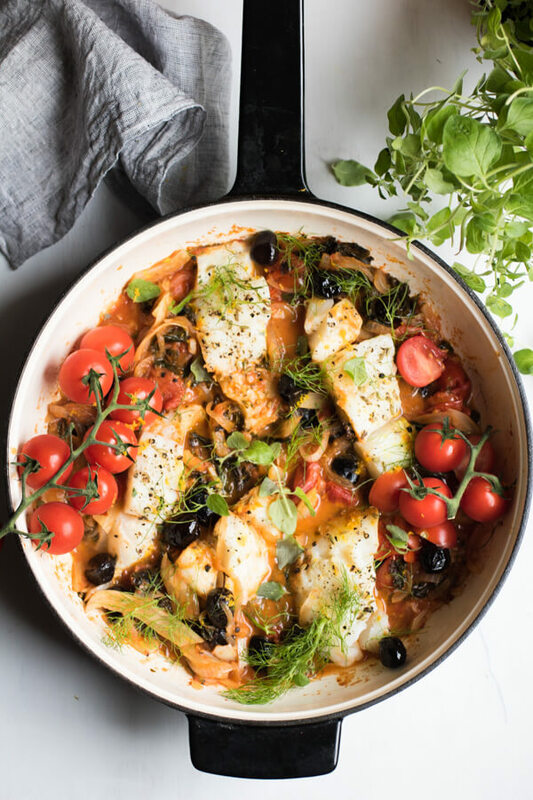 This dish, this beautiful Mediterranean cod is a must try. 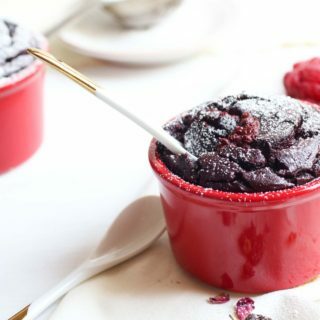 This recipe is an old favorite from my personal chef days and was my most requested recipe. Somehow, this beautiful cod ended up in the recipe graveyard and I haven’t made it for years. 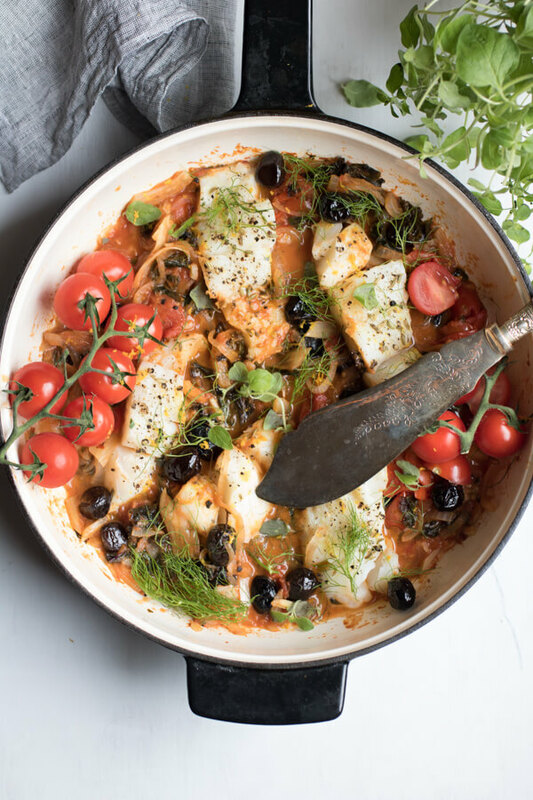 Then while prepping for a Mediterranean cooking class this week, I was digging deep in my recipe archives and pulled out a heavily stained, hand-scribbled recipe for one pan Mediterranean cod and thought, “Hey friend, where have you been!”. I have since made it twice in a week. I can’t get enough. The entire dish takes 32 minutes from start to finish. I literally turned on the stopwatch feature on my phone and pressed stop at 32 minutes exactly when the cod was flaky and perfectly cooked. Make sure you have a nice large deep skillet for this recipe. A large cast iron pan would work! I didn’t end up preparing this dish during my Mediterranean cooking class because cooking cod in a conference room in a corporate office in NYC is not the best idea 🙂 I did prepare a ton of plant-based, Med-inspired dishes that were all a huge hit, like these Mediterranean cauliflower nachos and this Mediterranean farro salad with roasted eggplant. The Mediterranean diet is the most studied dietary theory and for good reason! The Mediterranean Diet is a way of eating based on the traditional foods of the countries surrounding the Mediterranean sea. 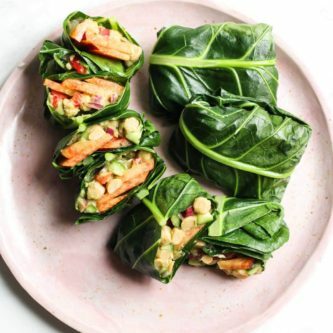 The most common eating characteristics are; abundant consumption of plant-based foods including fruits, vegetables, nuts, seeds, legumes, and whole grains (the majority of grains eaten are minimally processed). Olive oil is the principal source of dietary fat. 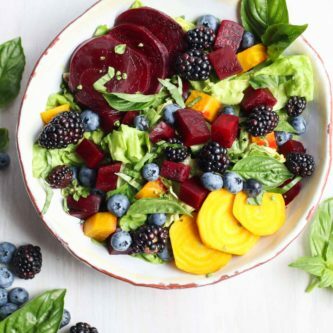 Fish, shellfish, and poultry are consumed several times per week, cheese and yogurt are consumed in moderate quantities, red wine is consumed in moderation, and sweets and red meats are consumed sparingly. The MedDiet is recognized as one of the best patterns of eating. 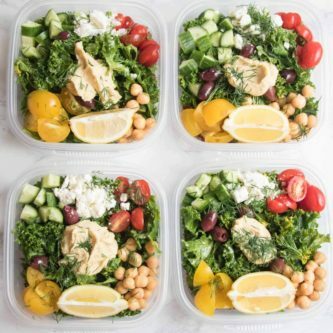 Studies indicate that the Mediterranean diet may help prevent type 2 diabetes’, can reduce heart disease by 79% in patients with established heart disease and appears to decrease the risk of several types of cancer by 13%. In class, I highlighted that the food consumed is really only one aspect of the Mediterranean diet, the true magic of eating in this region goes far beyond isolated nutrients in the food. It’s the lifestyle. The pace of life, the connection to family and community, the respect for the land and seasonal food, the immense respect for food tradition. You will be hard pressed to find people in the Mediterranean running to work while trying to quickly eat a bagel with cream cheese. Food is savored, respected. Eating is slowed down. 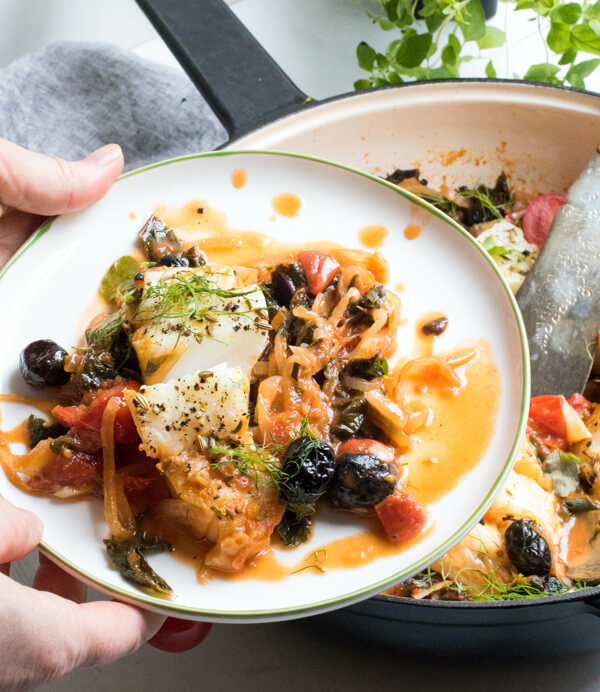 So although this quick and easy Mediterranean cod with black olives and kale takes only 32 minutes to prepare, I hope you take the time to savor it, share it with someone you love. Slow down. Sip a glass of crisp white wine. 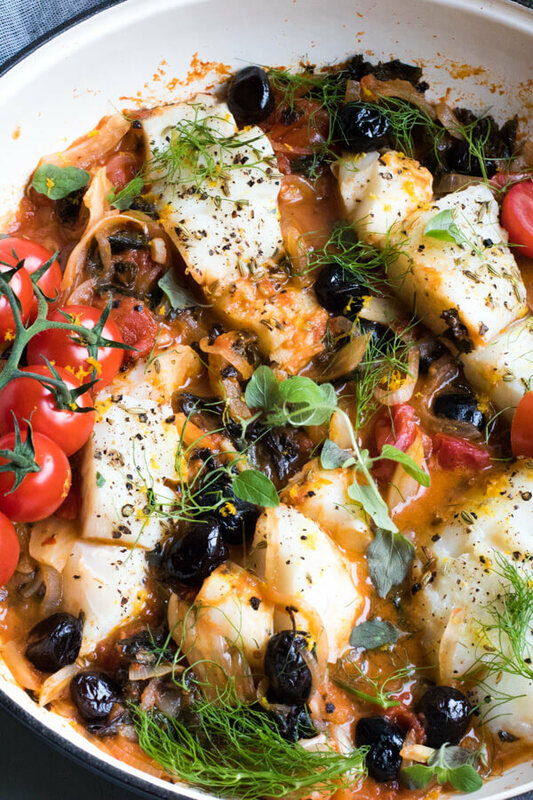 That’s the beauty of the Mediterranean way of eating, and that’s the real beauty of this Mediterranean Cod. What is a good substitute for Cod? I originally made this recipe using Chilean Sea Bass, but that is a much more expensive fish that isn’t always in my budget. Chilean sea bass or halibut would be great substitutes for cod or any thicker white fish. If you use a thinner white fish like sole or flounder reduce the cooking time considerably. In a large skillet (ideally with high sides) over medium heat, cook onion, fennel, and garlic in olive oil for 8 minutes, season with salt and pepper (about 1/4 tsp of each). Add canned diced tomato, fresh tomato, kale, and water. Stir well and cook for 12 minutes. Add crushed red pepper, fresh oregano, and olives. Prepare fish, season with salt, pepper, orange zest and fennel seeds (optional). Nestle fish into kale tomato stewing mixture. Cover pan and cook for 10 minutes. Remove from heat, and finish with fennel fronds, more fresh oregano, more orange zest, and a drizzle of olive oil on top. I’ve never seen this combination but I am definitely going to email this recipe to myself because I must try it. I love all of the ingredients in this recipe. My husband and son would love this recipe, They are huge fans of seafood and they both could benefit from a Mediterranean diet. 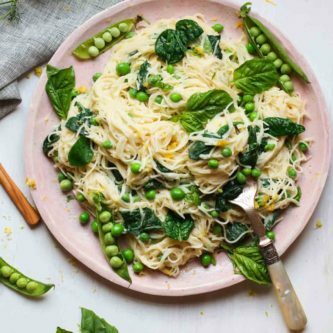 I do love one pan meals, they are so easy to make. This sounds like a dish that hubby would really enjoy. 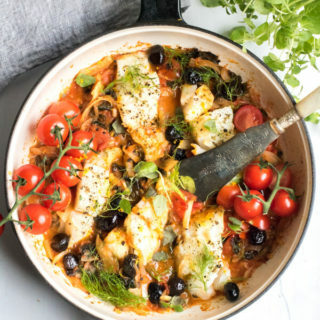 The Mediterranean-Cod recipe looks so good and festive. 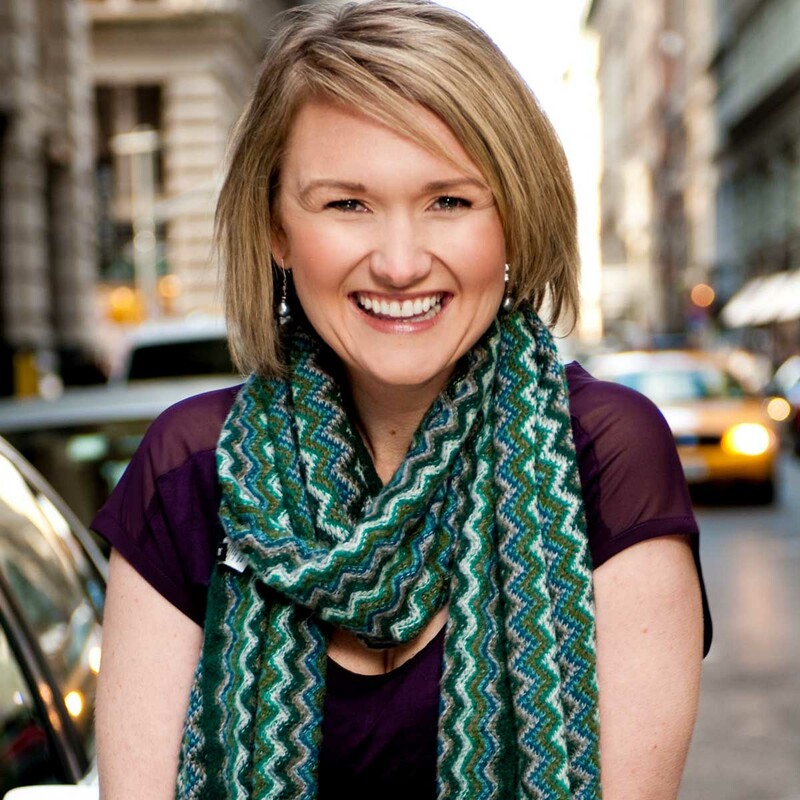 I like you incorporated kale + cod for a healthy diet. I am in need of healthy eating. Thanks Francisca! 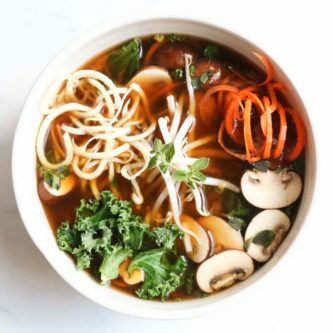 It is an easy healthy dinner, I hope it inspires more healthy eating! This sounds heavenly! 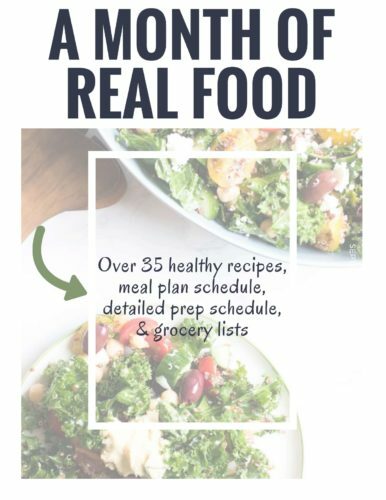 I love anything with kale and I am on a mediterranean food kick lately! We love it all! Thanks Neely! I know aren’t Mediterranean foods the best?!??! 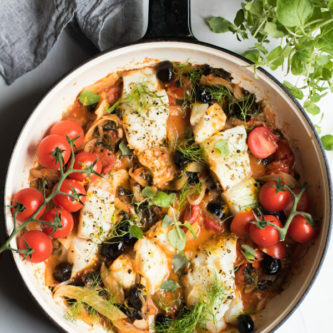 Your recipe for cod with fennel, kale, and black olives sounds absolutely amazing. 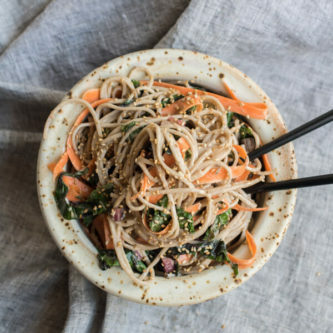 The recipe is also super healthy sounding! I pinned this straight away. Looks so good. I love the addition of the fennel and the olives. Hi Marissa, I used Tuscan kale in the recipe, it is shredded and sauteed, kind of hard to see in the photo but it is essentially part of the sauce. I have a video for the recipe coming soon so it will be easier to see how I use it. What you see on top of the dish is fresh oregano leaves, they were from my CSA so a bit larger than normal but so yummy! Quick question… for the can of diced tomatoes how many ounces did you use? 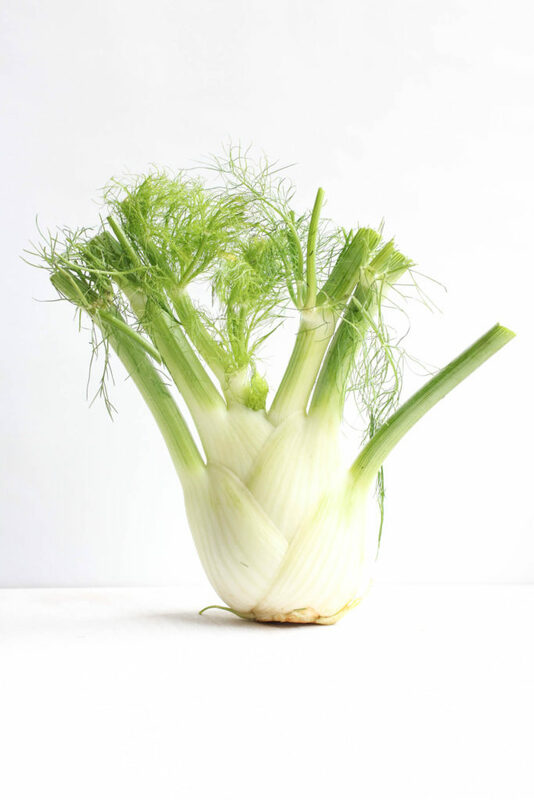 We are not real big fans of fennel, does the dish have a very strong fennel taste? It doesn’t, but honestly, you can easily remove the fennel. Maybe add a bit more onion rather than the fennel. Thank you for this wonderful recipe. Before leaving for work I made it for the missus and her friend for an afternoon get together and they loved it! I had considered sauteeing the cod briefly before adding it to enhance its flavour but I forgot about it. Later in the evening, when it was my time to devour the left overs I realised it was actually good I skipped the additional step since the flacours were in such a great balance. Your missus is one lucky lady! 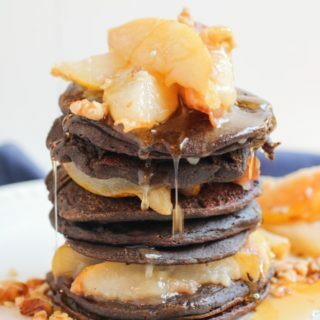 Thanks so much for commenting, this is still one of my favorite recipes. 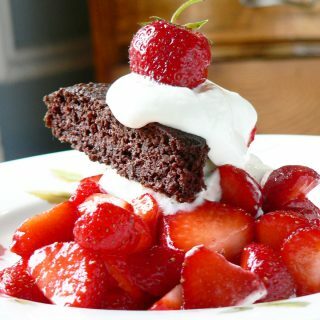 Love your website design and recipes. Everything looks so good! Amazing recipes i love it .